Ever say yes to something you weren’t sure you wanted to do? And then it changed your whole life? That’s what happened to me, one early spring morning when I went with a friend to record the dawn chorus. To be honest Jim Metzner was already more than a friend. We were both recently divorced and had started dating. 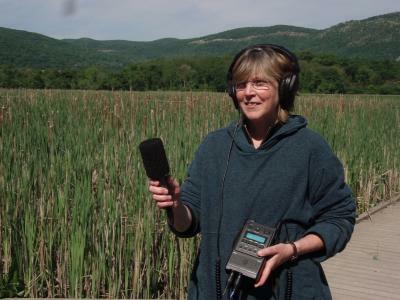 So when he invited me to go with him and his students on a dawn expedition to the Vassar Farm to record birds – he was teaching a class called “Re-discovering Listening” at the time – I said, “Sure.” In my numerous careers, I had never thought about recording bird songs. Frankly, I was thinking more about being with him for a sunrise than about capturing some morning tweets on tape. Jim brought along an old Sony cassette recorder in a beat up leather case for me to use. I hung back while he gave his class instructions and sent them off to record. Then it was my turn. He carefully placed the worn leather strap over my shoulder, adjusted the headset just so over my ears, and handed me the microphone, telling me to hold it lightly but steadily in my hand. Then he pushed the red record button. “We’ll meet up later,” he said, simply, and was gone. I should have stayed home sleeping, I thought as I watched him leave, standing there alone in acres of open meadow, trying to hold the microphone the way he’d shown me. The sun, higher now, lit the specks of morning dew and the grass glistened. Standing very still, I tilted my head toward the sky and closed my eyes. The visual landscape faded as I was consumed by the soundscape. I listened. And listened. And listened some more. Sure, I’ve always loved waking up to songs of birds on spring mornings, but this was different. The meadow had sprung to life. A cacophony of buzzes, tweets, gawks, trills hit my ears like my own personal orchestra. I was hearing what my ears had never heard before; it was like seeing the rings of Saturn through a telescope for the first time. A half hour later when Jim returned I was still standing in the same place. That experience turned the universe around for me. Shortly afterwards I bought my first digital recorder*, but I still have that old Sony and that electrifying morning chorus tucked away in my closet. Within a year, Jim and I started Sound and Story. Within five years we were married. But that’s a story for another time. 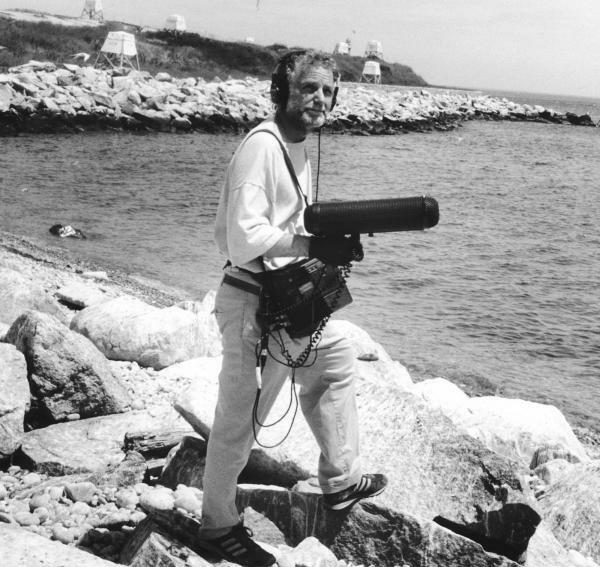 Jim recording with Sony cassette recorder before he went digital.